We see time and again how great music can be at teaching us the important lessons of life. And there is perhaps no more important thing for a young learner than to discover how to be a good person. This will help them in the short term and throughout their life. 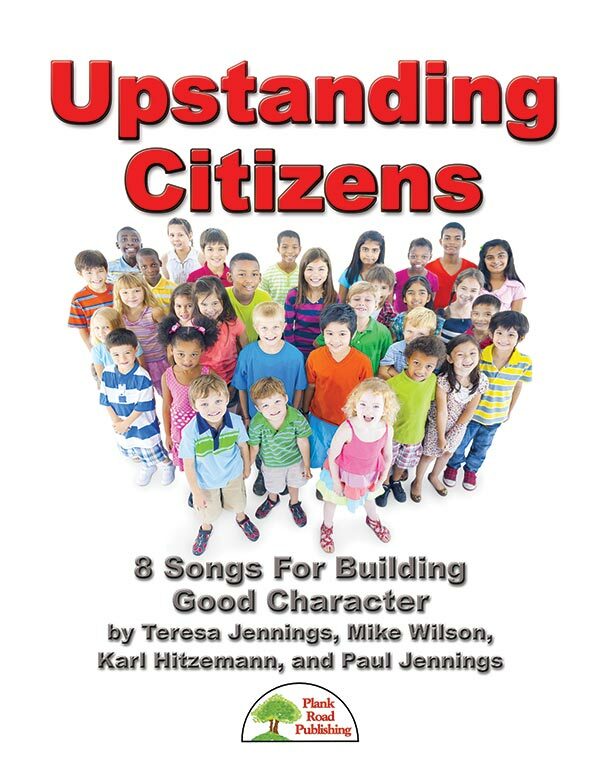 Over the years we have created dozens of great songs that help improve young characters, and that give teachers the opportunity to base lessons around songs they are singing. This valuable collection features eight of our most powerful tunes, each adding a unique brick to the structure of fine young hearts and minds. As a special bonus, we are including a new, optional script which allows you to combine some or all of these works together in a character-building presentation for your performers. An Upstanding Citizen - This upbeat swing tune has several things going for it. It's a partner song, it has a world-class big band accompaniment on the recording, it's incredibly fun to sing, and it has a positive message about character. My Personal Code - The beginning of this song leads us to believe that it will be a gentle ballad. One soloist shares his or her philosophy with the audience to the strains of a delicate piano accompaniment. At the conclusion of the statement, the entire piece changes abruptly with a large crescendo and becomes a rock tune with a driving pulse. Take My Lumps - Here's a character song about consequences. This song is a blend of pop and jazz featuring full rhythm and brass. The unison voicing requires a hushed yet intense approach on the verses contrasted with an all out, give-it-all-ya-got attitude on the choruses. Responsible - Your students will really identify with the style of this song. The contemporary percussive rock beat is contagious and the pulse is undeniable. The song's message is that we are all able to choose our responses to every situation life puts before us. Our response and reaction to those situations is what defines our character. I'd Rather Be Happy - People who consciously choose to think happy thoughts are more likely to have happier lives. The lyrics of this song remind us that a happy perspective starts with how we feel about ourselves. The tune is set in a pop/rock style that has a bit of a retro flavor. A bonus video provides ideas for simple movement you could add for a performance. Intentional Life - Set in a country rock style, this character song is about making your life count for something more than your own self-gratification. Now, that's a big subject for youth, but it sure merits discussion. And what better way to let those lessons sink in than through singing them! This piece incorporates two vocal parts. This World And Me - Do you remember what it was like when you were growing up? It certainly wasn't always easy. You might have thought, "Where do I fit in? Are these the right friends for me? How do I make some of these difficult decisions?" The first verse and chorus of the song are sung in unison, and then you have the option of adding a second part. The harmony really adds to the message of hope, courage, and togetherness. Rules For Living - This jazz style song with a phenomenal arrangement by Paul Jennings is easy enough for most students to sing. The lyrics of the song are all important. They're so important, that you might want to go over them with your students as a cross curricular topic and invite the regular classroom teachers to get involved.